These funfetti chocolate sugar cookies are a delicious way to welcome the holiday season. The recipe is super easy to make so you can whip up dozens at a time to give to your friends and family. Once you sink your teeth into these soft and fluffy cookies you won't stop smiling until the new year! Preheat oven to 350. Line a baking sheet with parchment or a silicone baking mat. In a large bowl or the bowl of a stand mixer, cream together butter and sugar until light and fluffy. Beat in egg and vanilla until well blended. In a small bowl, whisk together the flour, cocoa powder, salt, baking powder, baking soda, and cream of tartar. Add the dry ingredients to the wet ingredients and mix until a dough forms. Fold in sprinkles until well distributed. Shape into 12 equal sized balls and place on the prepared baking sheet. Sprinkle each ball with a few extra sprinkles for a nicer presentation. If your dough is fairly soft, I would recommend chilling it at this point for about 30 minutes. If your dough is thick (like mine was), bake in the preheated oven for exactly 8 minutes. Remove and let cool 5-10 minutes on the baking sheet before removing to a cooling rack. 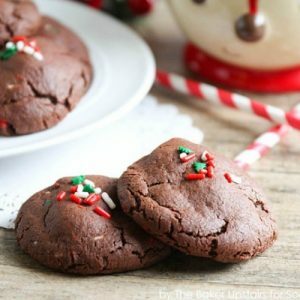 The cookies will look very soft and undercooked when you pull them out, but they will cook more as they cool on the pan.